magnificent landscapes and rural setting of Lamjung, Gorkha and Dhading. Gandaki River and Larke La Pass. authentic taste of Manaslu region. Manaslu circuit Trekking considered as one of the most challenging treks in Nepal. Manaslu circuit Trek is located at the Gorkha district of Nepal and lies within Annapurna trekking region. Mt. 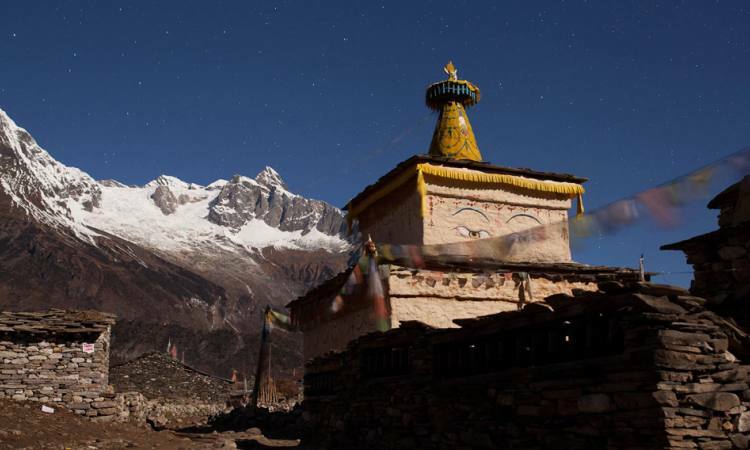 Manaslu is elevated up to 8163 meters and shares northern border with Tibet. Though it is opened for trekkers recently it has been celebrated for its supreme beauty and mixture of Tibetan and Nepalese culture adventure. This place is known for wildlife, different variety of wild flowers and rhododendron, powerfully flowing rivers and highly dramatic panorama of mountains. The best part of Manaslu trek is unquestionably the stunning and unopposed view of Manaslu. Due to improved trails along the Budhi gandaki the trek has become much easier than before. Each year 2000 people visit this place half of these visit during the month of October. Which is fewer then the trekkers visiting Annapurna and Everest. This is due to lack of camping facilities and due to its restricted area status. Manaslu circuit trekking is known for its prosperous biodiversity and superb scenic view of the mountain. Nepal the land of entrance diversification in terms of geography, nature and culture await its visitors to give them astounding memory. Among different trekking routes available in Nepal ,manaslu region is one the diverse trekking trail. The manaslu trekking takes you from the plain that land to the upper belt. The trek would be very adventures as the trekkers may hide and seek with the glavial river budigandaki along the trail the small business town of Nepalese rural society could bean unique experiences for you to observe the involving Nepalese rural people. The crossing of more the 20 suspension bridge could lit up the thorns in your skin out of enthralling adventure. The distant scenery mount manaslu could encourage you to walk hard as the mountains seems to be waiting you all the way to its lap. Day 01Your arrival to Tribhuvan International Airport (TIA) Kathmandu and transfer to hotel. Overnight at hotel. B.B.You will be welcomed by our team members at the Airport and will be then ushered to the Hotel. Our travel representatives and team members will explain briefly about the travel itinerary upon your arrival. Overnight stay at hotel. Day 02Drive to Arughat (700m) and soti Khola by Bus or Jeep and overnight at Hotel. The drive from Kathmandu to Dhading Besi on smooth pitched road and then the ride of bumpy, dusty postal road approximately 32 kms to Arughat. The arughat is the main starting point of this trekking and this small town gives you the viewpoint of the market to the village dwellers in Nepal. Arughat presents retail shops and houses of Gurung, Newar, Muslim and Chhetri community. The town is on the bank of Budhi Gandaki river which will be the uphill companion of all trekkers from the first day on of this circuit trekking. Day 03Trek to Machha Khola (900m) overnight at tea House. The ever glorious and ever flowing glacial BudhiGandaki River is our company and all the trekkers trek along its bank to meet the ultimate source of this gigantic river. The civilization along the banks of this river and surrounding rivers would enthrall your imagination of this area taking you to the Machha Khola. Day 04Trek to Jagat (1250m) overnight at tea House.The whistling stream and rocky ravines takes us to the hot spring area. There we could have a proper hot bath and take our lunch. At this very juncture we cross the river Budhi Gandaki river and reach the place called Doban. This means the the junction of two rivers in nepali. Day 06Trek to Deng (2600m) overnight at tea House. Deng offers you the chance to test your pride as the surrounding hills look small than ever while you feel as if you are the part of all these majestic tall mountains. The crossing of BudhiGandaki river again takes place in this area by suspension bridge. The Chhote Khola Hydropower Project has leased life to this dull area in terms of human settlement. Day 07Trek to Namru (3148m) overnight at tea House. This part of the trail presents the scene above river finally. The view of curling river is majestic and the trail accompanying the waterfall of Shiringi River too enthralls you and takes you to your dream wild land of nature. The forests of conifers and monkey will be on the way too..
Day 08Trek to Samagaun (3517m) overnight at tea House.The trek then accompany Thusang Khola. Manaslu and himal chuli are the major landscape from now on. The lama settlements with monastery and mane walls of Tibetan origin across the glacier fed Numla khola the valley is just few kilometers from Tibet. Day 09Rest day at Samagaun overnight at tea House.The acclimatization is done in Samagaon through mini hiking along and around Samagaon presenting you the chance to observe Tibetan influenced settlements, waterfalls and snowcapped mountains views. Day 10Trek to Samdu (3690m) overnight at tea House.The Samdo village is uphill walking from Samagaon as it presents Manaslu Glacier which branches off to Manaslu Base Camp. The path presents birch, juniper and rhododendron forests. The Samdo is also the village of Tibetan refugee as it is just an hour walk from Tibet. Day 11Trek to Dharmasala(4450m) overnight at tea house.This day’s walk is easiest one as we cross the Budhi Gandaki river for final time here and move towards Juniper and Rhododendron Forests along the Manaslu Glacial. Then we move towards Bimtang for lodging. Day 13Trek to tilje(2300m)overnight at tea house.The tough trekking ends here. We descend lower via juniper and rhododendron forests taking us back to the paddy fields and small swift rivers amidst flora and fauna. The trek reaches to the ultimate climax at this junction as we meet Dudh Khola. The crisp clean white river Dudh Khola which in English can be termed as Milk River. Day 14Trek to chamche or jagat Bensishahar overnight at Hotel.After Tilije we move towards Jagat from where hilly roads are constructed and we will have a jeep ride. The trail gives you the chance to encounter with the Dudh khola and Marshyangdi river meeting together. We will also get chance to meet the trekkers of Annapurna Circuit coming via Manang in this junction of the trek. Day 16sightseeing day On a spare day, you can roam around Thamel or other major touristic areas at Kathmandu and do some shopping and dinner at Nepali typical Resturant with cultural program. Day 17Departure for your onward flight.After Tilije we move towards Jagat from where hilly roads are constructed and we will have a jeep ride. The trail gives you the chance to encounter with the Dudh khola and Marshyangdi river meeting together. We will also get chance to meet the trekkers of Annapurna Circuit coming via Manang in this junction of the trek. Welcome to Nepal!!! Upon arrival in Tribhuvan International Airport Backpacker’s Airport Representatives will pick you up. The traveling plans and agenda’s will be discussed.